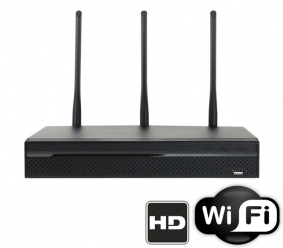 This network video recorder uses WiFi signals to reduce interference and allow signal transmission through obstructions while maintaining clear video quality. It is important to note that WiFi signals introduce a slight delay in the video feed of up to 1 second between the action happening in real life, and it being seen on the recorder. WiFi allows a digital data signal to be sent from the camera to this NVR, where the digital signal can be composed of video, audio, and PTZ controls. Not only can you used fixed lens bullet or dome wireless IP cameras, but you can also use our wireless PTZ cameras. In fact, by using methods detailed in our wireless security camera guide, you can make our wired IP cameras wireless by using a wireless access point and pair them with this recorder. You can even use this NVR with wired cameras on the network by connecting the NVR and wired IP camera to the same PoE switch. As long as the NVR and the camera are on the same network with properly configured IP addresses, they will be able to communicate with each other. If you are interested in learning more, be sure to read our guide how to choose a security camera. This is a standalone surveillance video recorder because you do not have to connect it to a computer. It is a computer itself, and comes with its own embedded processor and Linux Operating System which stays virus free. It will never need any maintenance from a computer IT person, saving you a lot of undue costs. It has a friendly easy to use graphical user menu that can be controlled using the included mouse with point & click. There is 1 SATA port for one hard drive up to 6TB in capacity. If you need more room, you can set some or all of your cameras to record on motion detect only. It also has a USB port for easy video backup of short segments to a external USB hard drive. You can also set live video backups to FTP or NAS. This NVR comes with Free Technical Support from our team based in the USA. All the cameras we sell at CCTV Camera World are compatible with our NVR recorders, and Tribrid DVRs. If you are looking for compatibility with cameras purchased elsewhere, please be sure to review our IP camera compatibility list. Dimension (W×D×H) 10.24" x 9.7" 1.87"
Can give me a solution? You cannot use the 4 channel nvr to make a 6 camera setup.